The spiralling conflict in eastern Ukraine is in the spotlight at the Munich Security Conference with a rift opening between the US and Europe. Washington is considering supplying lethal weapons to Ukraine, while European nations are opposing the move. 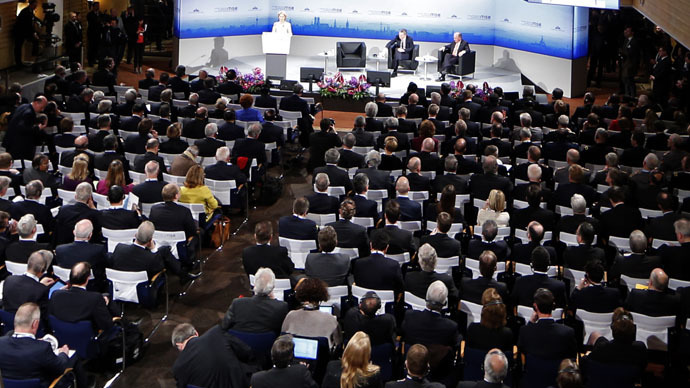 Among the most anticipated speakers on Saturday, considered the most crucial day in the conference, are Russian Foreign Minister Sergey Lavrov, German Chancellor Angela Merkel and US Vice President Joe Biden. The event comes in the wake of the much anticipated and secretive talks between the leaders of France, Germany and Russia, which were held behind closed doors in the Kremlin late on Friday. The German chancellor and the French president went to Kiev and Moscow to work out a solution to the conflict in the Normandy Four format (Russia, Germany, Ukraine and France), which would satisfy both Kiev and the eastern Donetsk and Lugansk regions. While there have been no details provided on the talks held in the Ukrainian and the Russian capitals, it has been noted the sudden initiative by the European leaders came as US Secretary of State John Kerry was in Kiev, discussing possible weapons supplies to government troops. This has been perceived as a sign of the US and the EU being divided on ways of dealing with the Ukrainian crisis. “I think the US is concerned that Europe can take an independent path away from the Unites States, in other words away from the NATO alliance in defense of their own national interests,” Brian Becker, director of Anti-War Answer Coalition, told RT. Sergey Lavrov is expected to meet the US Secretary of State John Kerry in Munich as well as NATO Secretary General Jens Stoltenberg. Despite NATO generally disapproving of providing weapons to Ukraine, tensions between the alliance and Russia have lately been particularly high. NATO attempted to lay the blame for the situation in eastern Ukraine on Russia though Moscow has long rejected allegations of its troops being engaged in the conflict. “I say it every time: if you are so sure in stating that, confirm it with facts. But no one can or wants to provide them,” the Russian foreign minister said in January. Moreover, Moscow criticized the West for calling for dialogue between authority and opposition "everywhere in the world," except Ukraine. "Western colleagues say that in Ukraine the most important thing is to support Kiev’s actions,” Lavrov said on Monday. NATO countries are supplying millions of dollars worth of non-lethal military goods to Ukraine, including body armor, NATO standard helmets, hundreds of thousands of food rations, barbed wire, optics etc. NATO’s Response Force in Europe might increase to 30,000 troops, more than double the current 13,000. Most of the troops will be stationed near Russia’s borders. The Russian NATO envoy, Aleksandr Grushko, believes “there is a bulk of evidence that Western-made arms are being used in Ukraine,” mentioning lethal munitions such as NATO standard artillery shells.